And the funny thing is I’ve been training King now for about 6 years. That means he’s been through hundreds of workouts with me. What happened was that it started as an experiment, and then it became an obsession. It’s the powerful (yet ADDICTING) method of combining the power of a Ladder and a Finisher. A ladder, as you know, is when you start with a certain number of reps for a superset or circuit and work your way up or down. For example, you start with 8 reps of each exercise, then 7 reps of each, etc., etc. The rest periods?… ha, that’s up to you. Your goal – to BEAT the time it takes to complete your finisher every time you do it (with good form of course). 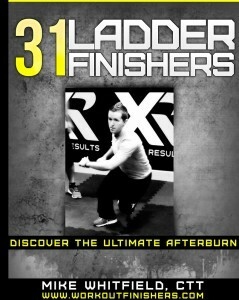 What happens you combine the power of a ladder and a finisher? Well, you create a lot of density. Density means you’re putting in a lot of work in a very short period of time. This means improved conditioning, FASTER fat loss and the best part – it’s MUCH better than cardio in just a fraction of the time. But forget all that for a second – here’s the best part – research is showing you’ll KEEP OFF the unwanted fat. Researchers from BGSU delivered two different 12-week weight loss programs to 59 overweight adults. One program, “New Perspectives”, focused on helping them fix their unhealthy relationships with food, while the other program, “Transforming Your Life”, emphasized environmental modification, good habit formation and breaking old habits. Both groups lost weight and changed their lives. HOWEVER, the subjects in the habit-changing “Transforming Your Life” group were more effective at maintaining their weight loss during the next 6 months after the study (when they were on their own without researchers). Now when you know you don’t have to run like a hamster every day and can have fun with your workouts, you’ll stay more consistent, wouldn’t you agree? That’s why these Ladder Finishers work so well and why my readers and clients love them. They are MUCH shorter than long, boring cardio and they are a lot more fun. The # 1 secret behind Ladder Finishers on why they work so well and help you burn more fat is because of the short rest periods (which are dictated by YOU), and the ridiculous VOLUME you exert in such a short period. They are tough, but they are FUN!